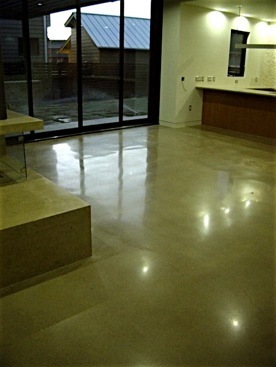 Welcome to your information source for the concrete polishing process! Polished concrete, or diamond surfacing, is becoming known as an aesthetically pleasing, durable and efficient treatment which eliminates the need for coatings, sealers, carpets or tile. It is a remarkable process that can transform ordinary concrete into the reflective “feel” of marble. In addition, our creative team can use our experience in the concrete staining and designing process to combine techniques in coloring, dyeing and polishing to achieve a true work of art!